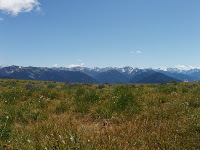 I was pretty excited that my running club, PIH, had decided to organize a 1 day trip across the U.S. boarder to explore what Olympic National Park had to offer. 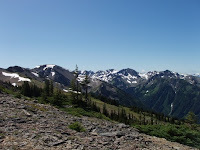 Hurricane Ridge is about 5000 ft. in elevation and most of our run would be in the alpine. This opportunity was simply too good to pass up. In addition, there were some real high-flyers signed up for the training session, and I always have the desire to keep pushing myself to the next level, and that is best done by surrounding yourself with elites. At the same time, this would be my first social running club event, so I also saw a big opportunity for me to meet others in PIH and really get to know them. The schedule that was sent to us pre-event from Bob Reid indicated that we would be looking at around 3 hours of running. Perfect. I therefore was going to use this time to get in my usual Sunday long run..just in a different environment than the usual. The day started early at 3:50 am, and I grabbed a quick bowl of cereal and jumped on my bike. I actually had left more than enough time, so I took my time getting to Bob Reid's place for the shuttle rendezvous. Julie Van, Jason Louttit and Gary Duncan would join me in the shuttle and we were off at 4:45 am. The mood was light and the excitement was building. In no time at all, we were at the meeting point downtown where 4 shuttle vans and 36 runners assembled. We organized ourselves into the designated shuttles, and then we headed for the ferry lineup. Now at the Coho Ferry terminal, all we could do now is just wait for all of us to present the officials with our passports and load the boat. A couple people from our group had some I.D. issues, but everything was sorted out and we still had 36 of us on the ferry. The Coho Ferry is an old, slow boat that has little to offer in terms of services. This vessel makes B.C. Ferries look like Princess Cruiselines. However, I ate a couple of bagels along the way and spent my time at the front of the boat getting to know some of my fellow running friends. At 6:45 am, Bob Reid had everyone sit down at the front of the boat where he showed us the maps and the options for our run. I had already decided that I would be running as far and as long as possible. That is, after all, my forte. We disembarked and shuttled our way through Port Angeles to a grocery store to pick up some last-minute items. 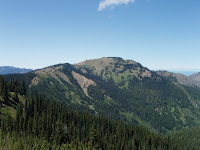 We then followed the signs to Deer Park in Olympic National Park. The drive was an ascent through a dust-ridden logging road. The dust was as thick as pea-soup. 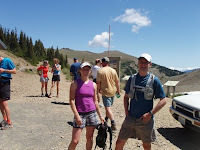 However, it was all worthwhile, as we eventually got to the Deer Park parking lot, which would be the start of our run. After some last minute gear-checking and a few token group photos, the run now began. The scenery was remarkable, and the trail was well defined. The initial part of the trail was a decent through the spruce trees. Occasionally we would pass meadows filled with wildflowers. We were cautioned to be aware that we were running now at altitude. Strange things happen to people at altitude, and it certainly is more taxing on your physiology under these conditions. However, I felt nothing and carried on as normal, as if this was just a typical trail run back in Victoria. The trail then began to climb. And climb. And climb. 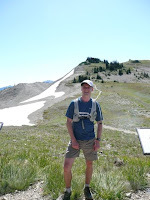 The steepness was not too bad, but I decided to conserve my energy somewhat by power-hiking up some of the ascents. In the early going, there were just a few people in front of me, but in due course, the runners all found their different paces and I was close to the front. Not that it was a race by any means, but I did want to surround myself with people who would push me somewhat.For a little while, it was just Shane Ruljancich and Chris Kelsall infront of me, but shortly after, national trail runner Jason Louttit blew by all of us on his way to doing his own extended route. As we left the treeline up into the alpine, I was in a pack of guys who are all very strong runners: Shane Ruljancich, Gary Duncan, Garth Campbell, Chris Kelsall. In fact, if you were to look at all of our best 10k times, I am slower than these guys by a good two minutes. That is significantly slower. But trail running seems to be different for me. I don't know why, but it just is. I religiously kept the nutrition going along the run. With gels, S-Caps and my Nathan hydropack, I wasn't going to let anything bring me down this day. After taking the gel, I got a second wind and began to push the pace a little. Shane joined me and it was now just he and I for the rest of the way. I was thrilled to be able to keep up with him. He is as solid as they come in terms of trail runners. Shane had raced the 1/2 Monty race (25k) the day before, so he was definitely going at an easier pace than normal. However, we both were feeling great at this point. I cannot put in words how stunningly beautiful this area is. It actually made the running hard somewhat, because I was wanting to keep my head up to admire the surroundings, but at the same time, one wrong step on the trail could bring you down. About an hour in, we saw an orange marmot. At least, I think that is what it is. I'll have to google it and find out for sure. Shortly after, Shane and I could see the parking lot at Obstruction Point. Shane said, "Wow, we are only 5 minutes away." However, although we could see the parking lot, it actually still was a long way off. The last section was running on broken bits of shale. The side of the mountain we were running on was steep. You certainly would not want your feet to stray from the trail at all. Then we saw Jason Louttit on his way back. He actually wasn't that far infront of us really. We arrived at Obstruction point after 77 minutes. Shane and I then looked at the map to see what our options were at this point. We definitely wanted to do more, so we decided an out-and-back down to the lakes would be the best idea. We were just about to head off when we saw the rest of the fastee troop arrive. We high-fived them all as they finished, but I was ency to keep going. After all, it was my original goal to run for 3 hours today, so there was no time to sit around and socialize. I told Shane I was going to keep going, and he promptly joined me as we headed up the next ridge trail. The other fastees followed, but Shane and I kept the pace strong. The trail went up and over a ridge, and then we descended very sharply for a few k's. In fact, I began to get some concern that the final stretch for us would be torture, as it would be nearly straight up. We passed a few hikers along the way, and then we could see the lake in the distance. And just when I wasn't paying my full attention to the trail, I went down. I didn't lift my foot quite high enough to get over a rock, and I was simply lucky that I fell in a soft spot next to some wildflowers. Talk about stopping to smell the roses. At the same time, my calf began to cramp at I hit the ground. This was a sure sign that the rest of the run was going to be a struggle. I brushed myself off, and we got to a river. It looked like the trail now was flatter up ahead, but I told Shane that we should probably turn around, in so that we made it back to the parking lot in time. He agreed, and we now started the long run up the mountain. Ok, we didn't run. It was nearly impossible to run this ascent. Shane said he thinks he could do it if he was fresh, but we certainly were anything but fresh at the moment. So, we powerhiked up and up and up. Being such a good climber, Shane dropped me and my pace slowed down as I struggled with my cramping calves. I persevered on however, and soon I could see the other fastee group power hiking back way up the mountain. I eventually made some ground up, and eventually caught a couple of them by the top of the mountain. Shane was gone, and he was likely in the parking lot by now. Once at the top, I was able to jog down to the finish at the parking lot. The group then got back into their respective shuttles, drove to Port Angeles, had some food, and then took the ferry home. The last part of my journey was to get my bike again at Bob's house and bike home. I definitely wasn't looking forward to that. In total, it was 2:38 of running in the alpine. For the most part, it was a strong run for me. I hope that this kind of training run makes me stronger in the weeks ahead, when it really counts on the Nootka Trail and the Juan de Fuca Trail. 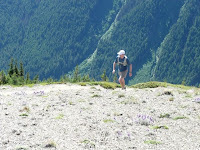 I would highly recommend every trail runner to take advantage of the Hurricane Ridge should the opportunity arise. In the years to come, I hope that I will be able to bring my family up here for some quality backcountry hiking and camping. It simply is stunning. Nice report Jeff. You were definitely running strong that day! Awesome time.